Editing note: Final paragraph added about two hours after the original post, but isn't marked as an "update"; rather, I realized upon re-reading that I had left the misimpression (by not mentioning Netanyahu's statements today) that the borders/return issues hadn't been addressed at all. It was only Obama ducking those issues; Bibi was, characteristically, gracious but blunt and wickedly wry. I should mention, too, that in the photo, those are just Marines in their dress uniforms as part of the standard White House detail. The rumors that Obama brought in SEAL Team No. 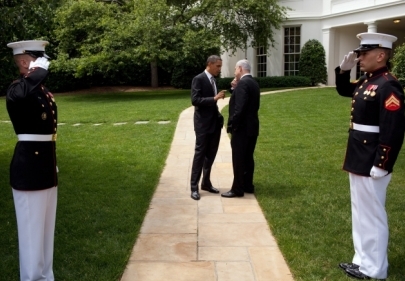 6 to supplement the Secret Service for the private meeting with Bibi are, so far as I can tell, completely unfounded. Because SEAL Team 6 doesn't exist. Of course. Do note, however, that this is the White House's choice as the Obama Administration's official Photo of the Day for May 20, 2011. This is what Barack Obama selects to be seen around the world: Him, flanked by symbols of American power, obviously lecturing the Prime Minister of Israel. Dear Mr. Dyer: Fine post. But I can't decide if this hideous Israel-bashing just The One's shallowness, or a cynical, what-do-I-care-I'm-going-to-end-up-in-Hawaii-when-I'm-done-I'm-all-right attitude. At the moment I think it's shallowness; The One really is that dumb. The photo is another clumsy attempt to bludgeon BN. Yet all the character and class run the other way. Unlike The One, BN has taken plenty of beatings, to the point where he was driven from office. He came back. Try to imagine The One showing the same resolution and fortitude. As for negotiations like you've never seen, for once Godwin's Law does not apply: The One is following the same path Neville Chamberlain did to the Czechs in the spring and summer of 1938. The constant pressure on and badgering of the Czechs, the cry that the Czechs were a faraway people of whom we know nothing, the unspoken repudiation of written and unwritten agreements with the Czechs are all parallels. They aren't perfect, but the resemblance is truly dismaying. In one regard, The One is even worse than Britain and France's leadership in 1938. They at least faced a formidable adversary, who could do them great harm. This gave them a common, if base, motive for heaving the Czechs overboard. Who but a fool thinks that the "peace process" will gain America one iota of security, even if Israel is wiped from the map and every Jew slaughtered? Mearshiemer and Walt have never been more smug than The One's speech has made them. This makes BN's dignity and resolution even more admirable. The US is greatly in his debt, though this won't be acknowledged until The One is booted to Hawaii, where he can start his post-Prez career by fanning the secessionist movement there. A fitting cap to his odious career. Because SEAL Team 6 doesn't exist. Of course. At the moment I think it's shallowness; The One really is that dumb. Yes, Sir: I believe that Occam's Razor strongly suggests that he is truly a WYSIWYG president (What You See Is What You Get). Dear Mr. Dyer: I've read Caroline Glick's article, and agree with you that she could have spelled out the steps of her thinking more closely. But shucks, even if she's only 25% right, she's miles closer to the mark than The One is. E.g. The One's imbecilic notion that a Palestinian state must be contiguous. CG thinks this means that Israel is to be cut in two, in the manner of East and West Pakistan from 1947-71. You say that isn't spelled out, so you disagree with her. OK, suppose you are right. If a) Israel is not to be cut in two,but b) the Palestinian state is to be contiguous, what's the answer? It's c) a sizable swap of territory, just as The One called for in his speech. But my God, look at the map you've provided. Tell me what sort of swaps would make c) work? It can't be done without eviscerating Israel, turning enormous amounts of physical capital to the Palestinians in exchange for worthless land that will need a lot of time and energy to be made productive. No no, CG may be alarmist, but she's bang right. The One's witlessness has reached new heights with this one. This doesn't even take into account the likely starvation of Egypt that is fast approaching because of rising food prices and capital flight from Egypt. Mr. Koster (#5), to play devil's advocate with you and Ms. Glick: The most charitable reading of the "contiguity" language is merely an endorsement of that as one of many desirable attributes to be considered in establishing boundaries of a Palestinian state. It could be accomplished by locating such a state only in Gaza or only on the West Bank (and not in both). It could be accomplished without bifurcating Israel by creating a long V-shaped pendant corridor to connect Gaza and the West Bank, created from territory previously at the extreme south edge of Israel's border. Of course, none of those alternatives is remotely plausible or practicable. In the light most favorable to Obama, it's still an ill-considered choice of potential attributes to mention. But it's not necessarily a new American commitment to cut Israel in half either, which is how Ms. Glick interprets it. I'm not disagreeing with you or her so much as confining, for present purposes, my arguments to that which I don't think the Administration could reasonably dispute or claim that I've taken out of context. I'm content today to prove more thoroughly that there's been an anti-Israel tilt, and I don't want to assume the burden today of also persuading that it's of apocalyptic magnitude. You've already mentioned the illegitimate parallels that successive US administrations have made, but this one needs more specific attention: "Israeli settlement activity continues. Palestinians have walked away from talks". These are presented as two offenses, one on each side, and comparable. But let's look at each one individually. The USA has the right to insist that the "Palestinians" engage in good-faith talks with the aim of recognising the right of a key USA ally to exist. So long as they do not recognise that right, the USA has a duty to side against them; it has no right to neutrality. On the other hand, not only has the USA no business telling a sovereign country where and how it may allow its citizens to build their homes; it's more than that: the USA's long-running disapproval of any building activity in Jewish towns in Judea and Samaria is inherently racist, and therefore runs against every US law and consitutional provision. It's as if the USA had not just tolerated but openly supported and promoted apartheid in South Africa, and insisted that the South African government institute it, condemned that government for not instituting it, etc. Such a situation would be absurd. How can the USA insist on a foreign government doing something that it would be blatantly unconstitutional for any US government to do? So far from being parallel and opposite offenses, the sentence quoted above downplays a real offense by the "Palestinians" while turning an Israeli virtue into a pretended offense. The USA must object to the first, and has no right to object to the second.